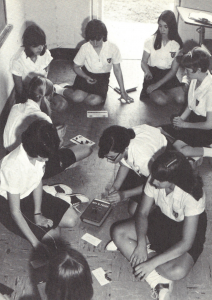 Academic Games started in New Orleans early in 1966 when a teacher at Mount Carmel Academy ordered Equations games in response to a magazine ad. In addition to the games, she received an invitation to the first National Academic Olympics in Fort Lauderdale, Florida. As a result, the students and their faculty moderator attended the first national tournament. Returning as evangelists, they taught students and teachers from other nearby high schools the following Fall. During the Christmas holidays of 1966, the New Orleans schools had their first local competition—an Equations/Propaganda tournament—conducted by Robert W. Allen and R. Lawrence Liss from the National Academic Games Project in Florida. The teachers at the tournament, led by Brother Neal Golden, scheduled two- and three-school Equations matches during the second semester of the school year. Brother Neal took five players from St. Aloysius High School (now Brother Martin High School) to the second Olympics in the spring of 1967. 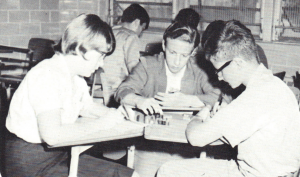 For the 1967-68 school year, the schools formed the New Orleans Equations League and played weekly matches from January through March. A competition was held in two divisions, Junior (grades 9-10) and Senior (11-12), and the top scorers qualified for the third Olympics. Additional games were added starting with On-Sets in 1970, then Propaganda and Mr. President. As a result, the name of the organization was changed to the Greater New Orleans Academic Games League. Eventually, more high schools joined the league, including the first public schools, which were from Jefferson Parish. Soon Middle Division competition was added for grades 7-8 and, a few years later, Elementary Division (grades 6 and below). In 1975, the unwieldy size of the league caused a split into the New Orleans Academic Games League and the Jefferson Parish Academic Sports League. Currently, the NOAGL welcomes public, private, and charter schools from all over New Orleans and the surrounding area. The league continues to send students who qualify to the AGLOA (Academic Games Leagues of America) National Tournament held every spring. The league operates under its founder and current director, Brother Neal Golden. It has helped form—both academically and socially—thousands of students of all ages from all over the Greater New Orleans Metro Area.